Marshall Curry has been selected by Filmmaker Magazine as one of “25 New Faces of Independent Film”. He was awarded the International Documentary Association (IDA) Jacqueline Donnet Filmmaker Award and has received the International Trailblazer Award at MIPDOC in Cannes. Curry has appeared as a guest on television and radio numerous times, including NPR’s Morning Edition, ABC’s Nightline, PBS’s The Tavis Smiley Show, and others. He has been a guest lecturer at Harvard, Duke, Columbia, NYU, and other colleges, and he has served on juries for the International Documentary Association, the Tribeca Film Festival, Hot Docs Film Festival, Full Frame Documentary Festival, AFI/Silverdocs, and the Gotham Awards. All three of Curry’s films have been a part of the American Documentary Showcase, a program sponsored by the U.S. State Department to share the art and practice of documentary filmmaking with the international community. As part of the Showcase, he has traveled to Israel, Jordan, Kosovo, and Ukraine to lead classes and discussions about documentary filmmaking. 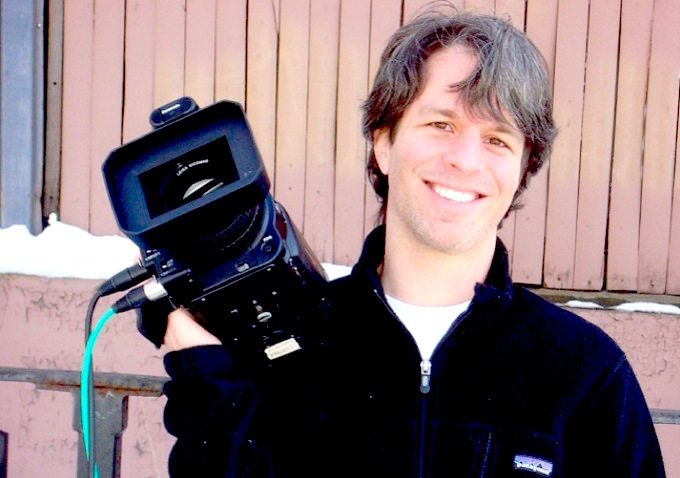 Before making films, Curry worked for a number of years at a New York multimedia design firm, where he produced and directed interactive documentaries and websites for the Mashantucket Pequot Museum, the Metropolitan Museum of Art, and others. Prior to that, he taught English in Guanajuato, Mexico, worked in public radio, and taught government in Washington DC. He is a graduate of Swarthmore College where he studied Comparative Religion and was a Eugene Lang Scholar. He was also a Jane Addams Fellow at Indiana University’s Center on Philanthropy, where he wrote about the history, philosophy, and economics of non-profits. 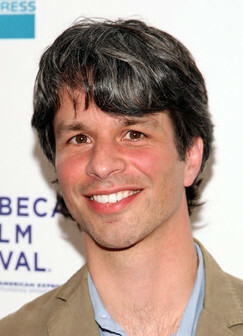 Curry was the director of STREET FIGHT, RACING DREAMS, IF A TREE FALLS: A STORY OF THE EARTH LIBERATION FRONT, and executive producer of MISTAKEN FOR STRANGERS. This entry was posted in Interviewee and tagged Adelaide, AFTRS, DocWeek, IF A TREE FALLS: A STORY OF THE EARTH LIBERATION FRONT, Joost den Hartog, Marshall Curry, Masters in Screen Arts and Business, MISTAKEN FOR STRANGERS, Nick Bolton, Originator, RACING DREAMS, STREET FIGHT, The Art of Perseverance, The Art of Perseverance in Documentary Filmmaking on February 3, 2014 by n1ch0la5b0lt0n. As part of my strategy to interview Originators, I am organising panel sessions at relevant conferences. AIDC CEO Joost den Hartog is also on my Masters course and loved my idea of a panel looking at The Art of Perseverance in Documentary Filmmaking. 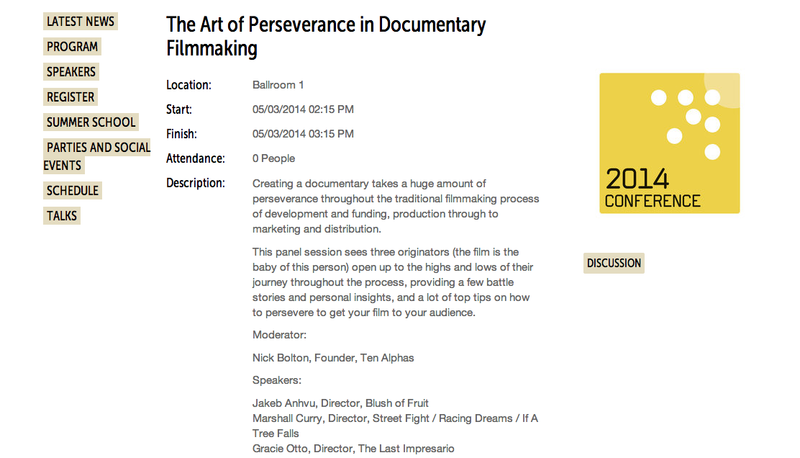 This entry was posted in Events and tagged Adelaide, AFTRS, Australian International Documentary Conference, DocWeek, Gracie Otto, Jakeb Anhvu, Joost den Hartog, Marshall Curry, Masters in Screen Arts and Business, Nick Bolton, The Art of Perseverance, The Art of Perseverance in Documentary Filmmaking on February 3, 2014 by n1ch0la5b0lt0n.